Clematis is one of the most popular climbers for the garden. There are many types to choose from and they all produce an abundance of wonderful flowers. From tiny delicate blossoms to plate-sized blooms, there is a clematis to suit every garden and taste. There are types that flower at different times of year and some varieties provide evergreen foliage, too. These beautiful climbers can be grown through trees, over fences, walls and garden structures or even in a container on the patio. They are easy to grow if you follow a few simple steps on planting, pruning and maintenance. Read on for advice on choosing the best variety for your garden and to learn how to keep it in good health. Follow our advice and your clematis will provide you with masses of colour year after year. Clematis is of Chinese and Japanese origin. This varies considerably depending on the variety, however, the most vigorous types can reach 9 metres (28 feet) when grown into trees or over large structures. Clematis are often divided into three groups based on their flowering times. These groupings help with knowing what type of planting, care and pruning your plant will need. This group contains the early flowering varieties of this climber. These plants will flower in late winter and early spring. Most varieties in this group prefer a bright sheltered position in the garden with plenty of sun. Some varieties in the group are evergreen and many have a lovely fragrance. They tend to be fast-growing and vigorous and are ideal for covering large areas of fence or wall. They have smaller flowers than some of the later blooming species. Popular varieties in this group include C. x Montana, C. armandii, and C x cirrhosa. C x armandii is an evergreen species with glossy foliage. They have white blooms from March to April and prefer a position in full sun. Varieties that are particularly good include ‘Snowdrift’ and ‘Appleblossom’. Clematis x cirrhosa is an evergreen species that has winter flowers against a backdrop of glossy leaves. They flower best in full sun. ‘Freckles’ and ‘Wisley Cream’ are popular varieties. Plants from the Montana species flower from May to June and can be grown in shade. There are many lovely varieties within this species such as ‘Marjorie’ and ‘Elizabeth’. This group of deciduous clematis flowers in late spring to early summer. They generally have larger and showier flowers than the early flowering types and many are more compact than those in the previous group. Group 2 includes lots of lovely hybrids. ‘Multi Blue’ is a compact variety with double blue flowers throughout summer. ‘Cezanne’ is a dwarf variety that is perfect for growing in a small garden or in a container on patios or balconies. It has sky-blue flowers. ‘Miss Bateman’ has single white flowers with a pinkish blush and a chocolate brown centre. It can be grown in a large container or over a smaller structure such as an obelisk. This group flowers in summer to early autumn. They are deciduous, and some varieties die right back to the ground in winter. These are quite vigorous plants and require the most pruning of all the groups. Group 3 also has the best range of flower colours. They flower on the current season’s growth and generally prefer a sunny position. viticella ‘Royal Velours’ has abundant crimson-purple flowers. ‘Gipsy Queen’ has single, velvety, violet flowers that can be up to 14 cm wide. ‘Polish Spirit’ has single open flowers of deep violet up to 9 cm in width. These plants are generally healthy, vigorous and flower freely. As long as you pay attention to their planting and pruning requirements they should give you years of trouble-free pleasure. The light requirements of your plant depend on the variety. Most prefer a sunny position, however, some, such as Montana, do well in partial shade. All varieties prefer their roots to be cool which can be achieved by underplanting or covering the base of the plant with pebbles or slate chips. 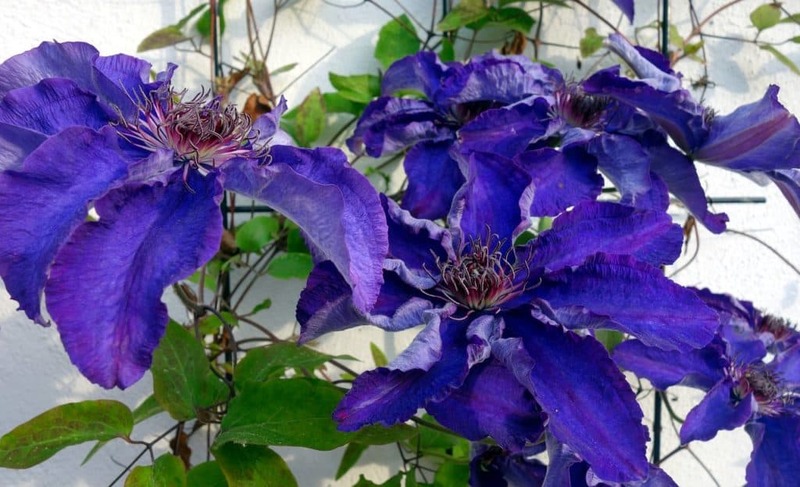 Your clematis will need watering weekly until it is well-established. After that, it will only need watering in dry spells. Give it a thorough watering once a week in dry weather, rather than a regular sprinkling. These climbers like fertile soil that retains water without becoming soggy. They also like a soil that is rich in potassium, so this should be added if required. Because these plants like a potassium rich soil, it is wise to give them a yearly application of sulphate of potash or rose fertiliser in spring. Mulch them with well-rotted manure or leaf mould at this time, too. Container grown plants will need more regular feeding. If your container grown clematis looks in less than optimum health, then remove the top few inches of potting compost and replace it with fresh. Clematis should be planted in spring or early autumn. If you are planting your clematis against a wall, fence, or tree, position the plant at least a foot, preferably two, away from the structure. Your plant will need a cane to enable it to grow up to the support. Fences and walls will need to have wires attached to allow the plant to twine up them. Herbaceous types, usually those in group 3, may need tying to their supports. Evergreen varieties should be planted with their crown at soil level, However, if you are growing a deciduous variety, plant it deep in the ground. You should water your plant well after planting and mulch it thickly, as these plants likes cool roots. You can also cover the root area with a layer of pebbles or slate chippings to keep the soil cool. If you are growing your clematis through a tree, ensure that is not such a vigorous variety that it will smother its host. 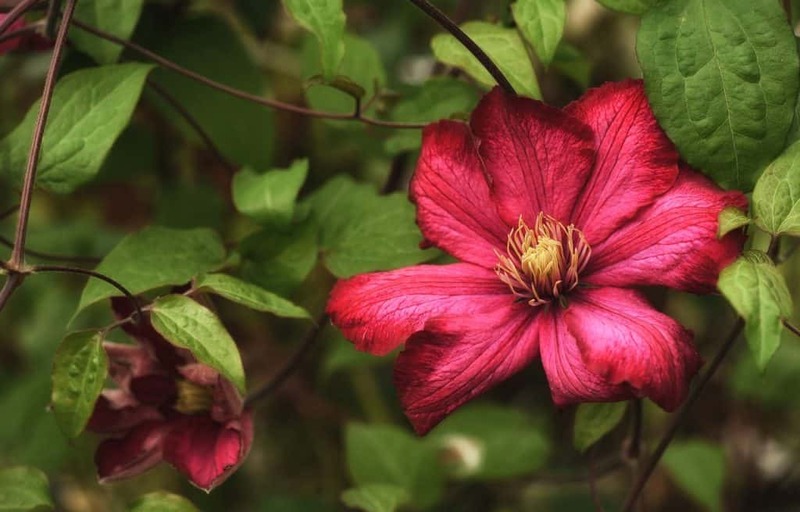 If you are planting a clematis in a container, choose one of about 24 cm in diameter to allow for plenty of root growth and to stop it from drying out too quickly in warm weather. You will also need to position a support such as a trellis or obelisk in the pot for your climber to twine around. Pot up you plant using a loam-based compost as multi-purpose composts tend to break down after a few years. Your new plant may be susceptible to slugs at this stage so protect it with slug traps, barriers or pellets. Once planted and established clematis requires little maintenance, especially the group 1 varieties that do not need pruning. Ensure that you water the plants in dry spells and water container-grown specimens regularly. Group three varieties produce new growth from the base and this growth should be protected against slug damage. Container grown plants will need their roots protected from very harsh winters and very hot summers. They like their roots to be kept cool so place other containers around them to provide a shady cool environment. You can use bubble wrap around the pot to protect the roots from winter frosts. There is a variety of clematis for pretty much every situation. The large-flowered varieties look stunning in a tropical garden and the more delicate types suit a cottage garden well. Having a range of these lovely climbers can mean you have them flowering almost all year round. The way to prune your clematis depends on the type you grow. All types will benefit from an initial cut back after planting, to about 30 cm (12 inches) above ground level. This will encourage multi-stemmed growth. If your plant already has several stems, then you will not need to do this. If you plant your climber in autumn, then prune it the following spring. Group 1 varieties flower on wood created the previous year. They do not require pruning. However, if they need to be cut back because they have outgrown their space, this should be done immediately after flowering. Group 2 varieties flower on side shoots arising from last year’s growth. This means they benefit from pruning which stimulates these new shoots. Pruning them after flowering can also result in a lovely second flush of flowers that year. Give these plants a light prune and tidy before new growth begins, in late winter or early spring. At this time, cut out any dead or damaged stems to just above a strong pair of leaf buds. Then, in early summer, after the first flush of flowers, cut back all the flowered stems to just above a pair of buds. If you need to cut back further to reduce the size of the plant, you can. However, try to spread this pruning over a number of years to avoid stressing the plant and also so you still have some flowering stems each year. This group produces new growth from the base each year. In late winter or early spring, cut back all the old stems to a pair of healthy buds around 30 cm (12 inches above soil level. This will keep the lower stems from becoming woody and bare. In general, try not to worry too much about pruning. You will rarely damage your plant. At worst you might see a year without flowers. You can propagate your clematis by taking cuttings. Prepare a 7.5 cm pot by filling with a mixture of half cutting compost and half horticultural grit and firming down. Select a healthy shoot from the current season’s growth and cut about 90 cm (3ft) of this stem to make your cuttings. Cut off the very soft tip and discard. This stem can be divided into cuttings of 5-10 cm (2 – 4 inches). Make a straight cut just below a pair of leaves. Remove the lower leaves of each cutting leaving just one or two leaves at the tip. Make several holes around the edge of the pot with a pencil. Dip the base of each cutting in hormone rooting powder before inserting into the holes. Water the pots and place on a windowsill or propagator or cover with a loose plastic bag secured with an elastic band. Check your cuttings weekly, water them, give them an airing and remove any diseased or damaged plant matter. Once the leaves begin to perk up your cutting has taken. You may also see signs of root growth emerging from the bottom of the pots. You can now pot each cutting up into an individual pot and place in a cool sheltered spot or cool greenhouse ready for planting out in spring. Aphids, such as blackfly and greenfly, can become a problem. If your plant is infested the leaves will curl and you will see the aphids on the undersides of the leaves. These can be removed by spraying with a strong jet of water. Alternatively, you can also use a soap solution or a homemade mixture of 1 tablespoon of bicarbonate of soda and ½ a teaspoon of liquid soap mixed into half a gallon of water. Spray the leaves of the affected plant. The young leaves and flower petals of clematis can sometimes be nibbled by earwigs. If you see nibble holes in your plant check them at night as this is when earwigs come out to feed. You can try trapping the earwigs by placing upturned flower pots on canes and stuffing them with straw. The next morning shake out the straw and remove the earwigs. This disease affects the large-flowered hybrids in group 2 most often and usually occurs in warm, wet weather. It is caused by a fungus that kills cells in the stem. This means no nutrients can reach the top stems of the plant. You should cut back your plant down to ground level and burn or safely dispose of any affected material. Luckily, this disease does not affect the roots of the plant so there is every chance that your clematis will come back as healthy as ever when conditions are better. This disease causes a white, powdery coating on the leaves. New growth is usually the worst affected. The disease is rarely fatal, but it can cause the leaves to drop off and the plant to look unsightly. It can also reduce the plant’s ability to photosynthesise, so, if the plant is repeatedly affected it may begin to weaken. This disease thrives in damp environments. Therefore, do whatever you can to reduce humidity around the plant. Water the plant at the base rather than on the leaves and water early in the day to allow moisture to evaporate. You should remove any weeds from around the plant and cut back other plants that are encroaching on your climber’s space. This will improve air circulation and reduce the likelihood of powdery mildew becoming a problem. Q My clematis is wilting at the tips and the leaves are shrivelling and turning brownish-black. What could be causing this? There are a couple of likely reasons for your plant’s ill health. 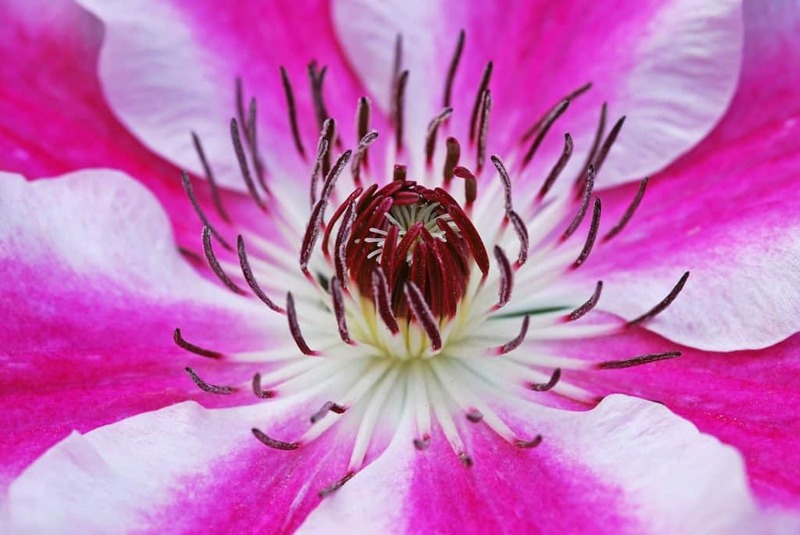 Your plant could be affected by clematis wilt or there could be a root problem. If your plant is in boggy ground it may be that the roots have begun to rot. Improving the drainage is the only way to solve this problem. This can also happen to container grown plants if they are planted in a container which is too big and stays wet for long periods. The other possibility is clematis wilt. If this is the case, remove and dispose of all the growth right back to the soil. The roots of your plant will be unaffected and should grow back healthy. Q My clematis C x armandii ‘Appleblossom’ only produces the occasional flower. What can I do to get it to bloom well? If your climber is refusing to flower it may be that it is unhappy in its situation. This plant needs soil that retains moisture but is not too boggy. Improve drainage if you can and water thoroughly but not too frequently: once a week if the weather is dry. This plant likes its roots in the cool and its head in the sun. If yours is planted in shade it may need moving. You can protect the roots with a mulch of pebbles, or by plant other plants nearby that will create a little shade at the base. Check that you are pruning your climber at the right time. You should undertake a light pruning after flowering. Cutting this climber back in late spring will remove the flowering buds for that year. Q The flowers of my white clematis have come out green. Why has their colour changed? Occasionally, in very cold weather, the first flowers of clematis have a greenish tone. Usually, once the weather warms, the plant will return to its former colour. Very rarely this green tone is caused by green flower disease which is more serious. If this is the case, you will need to destroy the plant. But most cases are temporary, and the flowers will return to their original colour with the warmer weather.